CarGurus has 40,820 nationwide Encore listings starting at $5,995. Quietly entering its fourth year of production, Buick’s 2016 Encore 5-door, 5-passenger compact crossover will debut a new trim when it goes on sale this fall. Look for three new colors--River Rock Metallic, Graphite Gray Metallic, and Summit White--as well as an available set of 18-inch, 7-spoke “Ultra Bright” wheels. Cargo space remains lackluster at a mere 48.4 cubic feet with the rear seatbacks folded, and the base turbocharged inline 4-cylinder (I4) engine is less than jaw-dropping. That being said, the uniquely-sized Encore returns in a class (almost) by itself, and offers a well-equipped alternative to the hulking full-size sport ute. The 2016 Encore is expected to include a brand new Sport Touring trim, meaning the 2016 lineup will start with the Base Encore, move to up-featured Convenience Group, then the new Sport Touring, the quasi-posh Leather Group, and the top-shelf Premium Group. Look for all trims to be delivered either in the standard front-wheel-drive (FWD) configuration or with available full-time all-wheel drive (AWD). The base 1.4-liter turbocharged I4 engine is again slated to power all 2016 Encore trims other than the Sport Touring, and will pair with a standard 6-speed shiftable automatic transmission to produce 138 hp and 148 lb-ft of torque. Expect mileage estimates for this force-fed I4 to remain 25 mpg city/33 highway/28 combined with FWD and 23/30/26 with AWD. Apparently in response to past criticism, Buick has equipped the brand new Encore Sport Touring with an up-powered (by some 11%, says Buick) version of the 1.4-liter turbo I4. This tweaked edition remains tethered to the 6-speed shiftable automatic but throws down a respectable 153 hp and 177 lb-ft of torque. Mileage estimates are not yet available for the reworked I4, but Buick has hinted that its 0-60 time will be a heck of a lot better than the base engine’s pitiful 9.8 second average. This downsized crossover is expected to shine in the area of appearance enhancements and creature comforts, with stuff like 18-inch alloy wheels, a roof rack, heated power-adjustable outside mirrors, and full power accessories coming standard across the lineup. Depending on the trim selected, look for the 2016 Encore to sport cloth or leather upholstery, heated power-adjustable front seats, a heated steering wheel, manual air conditioning or dual-zone automatic climate control, a rear-view camera, and an auto-dimming rear-view mirror. Technology is slated to include Bluetooth-interfaced OnStar telematics and Buick’s IntelliLink infotainment system with 4G LTE WiFi connectivity, while entertainment is expected to include a CD/MP3 player with 6 speakers, satellite radio, and an auxiliary audio input for all trims except the Premium, which will add a 7-speaker Bose premium system. Other noteworthy options aside from the debuting upgraded 18-inch “Ultra Bright” wheels are scheduled to include GPS navigation and a power sunroof. Expect standard safety features in the 2016 Encore lineup to include 4-wheel antilock brakes (ABS), traction and stability control, front side-mounted airbags, front and rear head-protection airbags, daytime running lights, turn-signal-integrated mirrors, and OnStar emergency alerts and communications. A post collision safety system also returns standard aboard the Encore, while the Convenience Group and higher trims return with standard front fog/driving lights and a remote antitheft alarm. The Premium Group will also sport standard lane-departure alerts with forward collision warning. The National Highway Transportation Safety Administration (NHTSA) gives the current AWD Encore its best 5-star rating, but FWD versions gather only a second-best 4 stars. The Insurance Institute for Highway safety, meanwhile, awards the 2015 Encore its highest score of Good in all tests but small overlap frontal offset, where the Encore earns the Institute’s worst score of Poor. Owners of the current Encore editions are disappointed with the lack of a standard or available remote garage door opener, and say that the IntelliLink infotainment and cargo-toting capability could use some improvement. On the plus side, owners enjoy the smooth ride, attractive cabin, and wealth of standard features that this compact crossover offers. Although the 2016 Encore occupies a rather distinct niche in the automotive world, alternatives like MINI’s potent Countryman, Nissan’s nimble Juke, and Chevy’s downsized Trax all deserve a look. 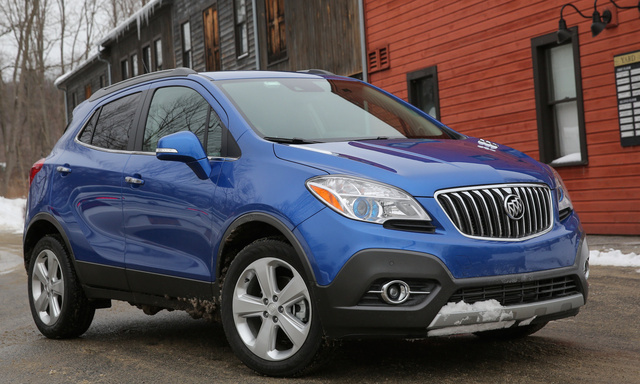 What's your take on the 2016 Buick Encore? Jane I would not recommend this Buick because it has noisey brake problems since it came ou in 2013. now our 2013 Buick Encore also has oil coolant problem. The dealer said even thought it is part of the power train because it is not necessary it is not covered by warranty. That is a bunch of bull. theebadboy2 We have his and hers 2015 and we both love them AWD she gets around town 28mpg and I'm getting 27.2 right now I have 4090 miles on mine and I have to say I love it's size and how it handles ... I feel like I'm driving a lil sport car as well as it handles the corners and smooth ride ... but then it is a Buick ! Tillamook I did some pretty lengthy research on suv's before deciding on the 2016 Buick Encore and I believe I made the right choice. I compared every import and domestic vehicle, (18 in all) before making this choice. The performance, mileage and options are very comparable but where the Buick really shines is it's style and reputation. It's just a very classy chassis. And like others have stated - 'but then, it is a Buick;. Users ranked 2016 Buick Encore against other cars which they drove/owned. Each ranking was based on 9 categories. Here is the summary of top rankings. Have you driven a 2016 Buick Encore?